January 5, 2016 — On Saturday, April 25th, a magnitude 7.8 earthquake–the worst earthquake to hit Nepal in more than 80 years–struck just outside the country’s heavily populated capital, Kathmandu, impacting areas across the country and its neighboring borders with India, China, Bangladesh and Tibet. The disaster triggered deadly avalanches on Mount Everest and in the Langtang Valley, and caused widespread building collapses, damages to infrastructure, injuries and deaths. Massive aftershocks continued throughout the month, furthering damage and making relief and recovery efforts difficult. Less than a month later, on Tuesday, May 12th, a second earthquake, registered as a magnitude 7.3, shook the country and exacerbated chaotic conditions brought about by the earlier quake. Soon after, the monsoon season arrived, bringing with it the risk of landslides and flooding in already vulnerable communities. As a result of the earthquakes and subsequent aftershocks, more than 9,000 people were killed and upwards of 20,000 people were injured. According to the UN, an estimated 8 million people were affected across 39 of the country’s 75 districts, 3.2 million of which were children and 2.8 million of which continue to need humanitarian assistance. 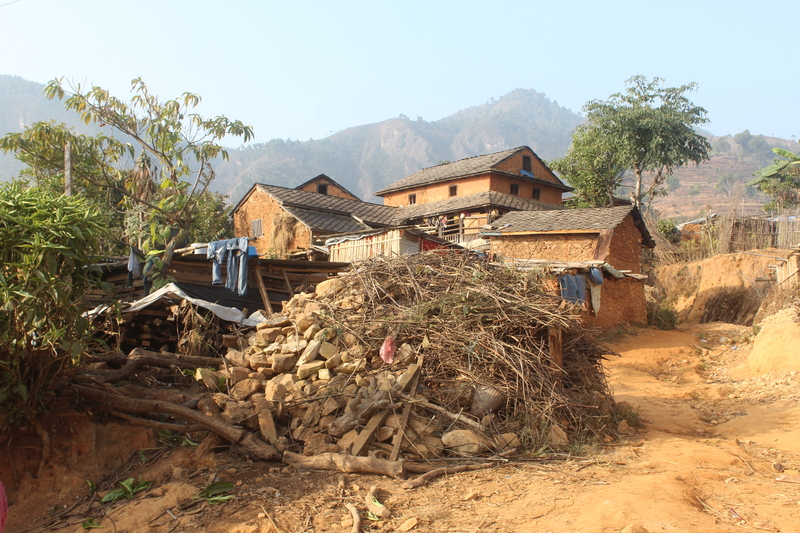 Among those impacted by the earthquakes, the villagers of Fyakse in the country’s Dhading district were particularly hard hit. The village suffered heavy structural damage, losing both it’s school building and the only health center available in the area. After visiting the village in July 2015, OpUSA programs staff decided to focus long-term recovery efforts in Fyakse and, thanks to donations from supporters, will reconstruct school buildings and aid in educational recovery programs. OpUSA also signed a partnership agreement with the Rebuild Nepal Foundation, which will serve as a local project partner moving forward. As Operation USA and the Rebuild Nepal Foundation’s education recovery project got underway, conditions were made worse due to political unrest in Nepal and the subsequent shut down of the Indian border. As the contentious political situation impacts the daily lives of all Nepalese, additional challenges surfaced as critical supplies and medicines were cut off, resulting in shortages that have intensified already vulnerable conditions in earthquake-impacted communities. The onset of winter will make matters even worse, further exacerbating precarious conditions as many families continue to live in temporary structures constructed from bamboo and corrugated zinc sheets. Operation USA is grateful to our supporters for their generosity in making relief work in Nepal a possibility. 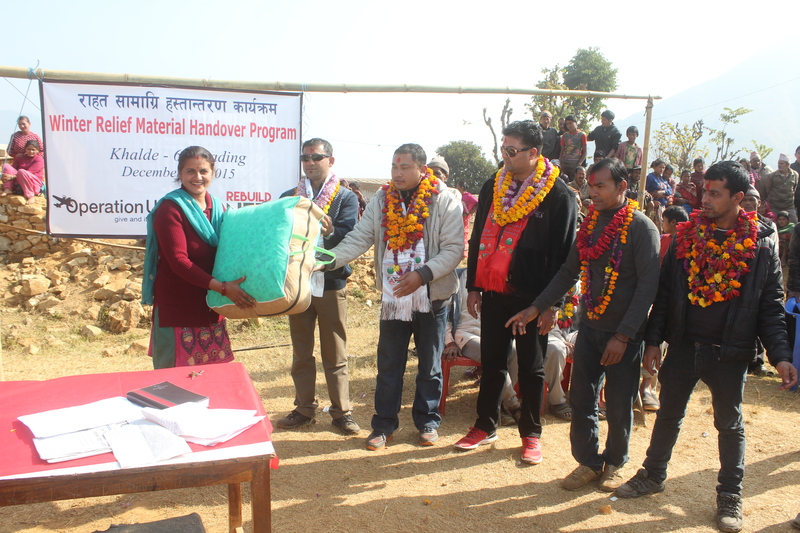 We would also like to thank our partners at the Rebuild Nepal Foundation for all their hard work in implementing these projects and delivering the winterization items to Fyakse. See all the photos from the distribution of items on our Facebook page here. To donate to Operation USA’s ongoing work in Nepal and/or in other countries around the world, visit give.opusa.org.